Buckingham Coatings is Proud to Offer a Lift Door Paint Spraying Service. All work undertaken as part of this dedicated service is completed to our trademark high standard and is available in affordable and competitively priced packages. Often lift doors require spraying or re-coating due to the residual damage that occurs to these high traffic areas. Damage to lift doors includes, dents, scuffs, scratches, stains and other cosmetic damages. Unfortunately, whilst this damage is often minor in its nature the impact it can have on the aesthetics of your interior can be dramatic, giving it a neglected and scruffy appearance. We are easily able to remedy this issue through our dedicated onsite lift spraying service. Our service is not industry specific and is available to any business sector that has a lift, including offices, retail, hotels and leisure premises. Our painting systems enable for all surfaces, including stainless steel, to be effectively recoated. Included within our paint offering are all of the colours contained within both the RAL and the British Standard colour coding systems. This means that our lift door spraying service can be used as a means of finally bringing your lift in line with your brand appearance, or as an opportunity to change colours completely. When performing lift door spraying on behalf of our customers we take every effort to ensure there is no resultant damage to the surrounding area. This is achieved through an extensive preparation process, prior to the commencement of spraying. Where required, we will also strip away any existing hand painted coats. Once complete, our preparation will ensure that all areas that are not being sprayed have been masked. 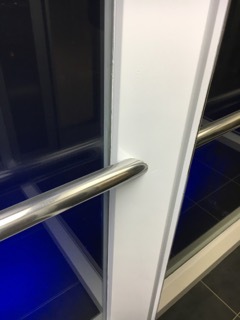 This measure serves as a guard against over-spray and offers the optimum surface on your lift doors for us to apply our hard-wearing two-part acrylic finish. We wish to assure you that our work will result in the minimum possible level of disruption to your business. One way in which we assure this is, where possible, completing all our work outside your business hours, this includes working either at night or on the weekend. All our lift door spraying services are completed onsite and in-situ. For information about our lift door spraying service, including paint options, or to arrange a free no-obligation site survey, please call us on: 01908 765 009.